Are you ready to get your students moving on the first day of school. 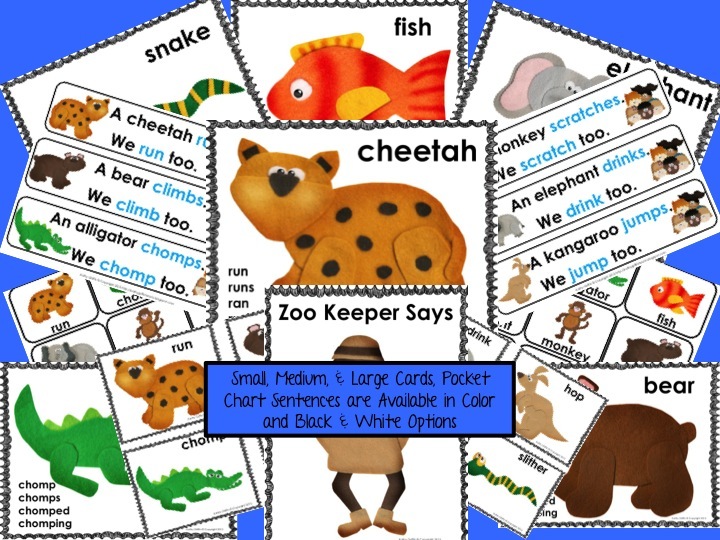 Here is a clip of my new Zoo Action Verb Dance multimedia file and activity packet. It's modified to the tune: The Green Grass Grows All Around. If you are familiar with the song, then you know it repeats over and over again. The result? Your students will get lots of movement, creativity, and dramatic fun while learning about action verbs. Here are frequently asked questions: Do you introduce your songs as you teach the concept. Answer: No, we "do" the songs all the time. Our students need movement, laughter, and fun to make meaningful connections to learning. So we sing everyday. We move everyday. We dance everyday. And then we connect it to learning as an integral part of our classroom curriculum. When it comes time to do the "Verb" study, they've had so many meaningful connections, that it clicks. They get it. Here is the litmus test I use when doing a new activity. Are they smiling? Are they having fun? If the answer is yes, then their brains are more receptive to learning and remembering. What would you rather do on an "inservice" professional development day? Listen to someone talk all day long (you can't have your cell phones out:-)? Or move around, try out the activities, and rearrange them in your room? The multimedia packet comes with the Quick Time file to display on any interactive whiteboard, Smart Board, digital projector, or computer. You can stop it along the way to focus on individual skills or animal movements. 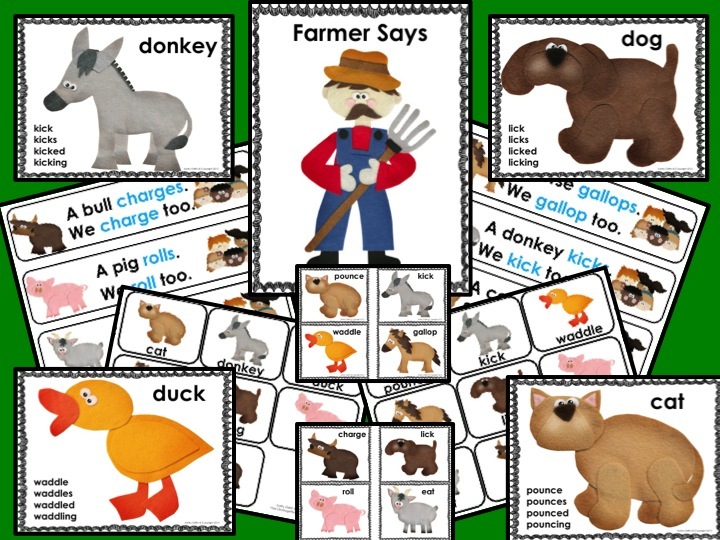 You can work on phonics, letter sounds, rhyming words (what rhymes with fish?). 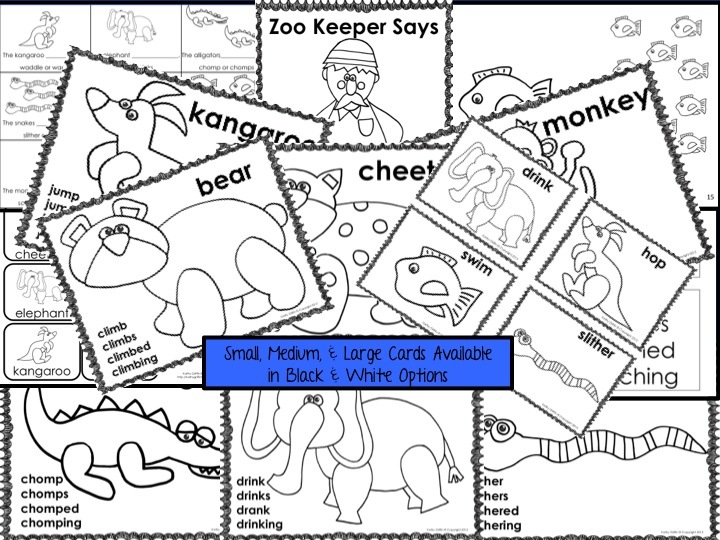 Then I have included an activity packet with the mp3 version of the song (for those that don't have the technology) and all of the animal cards to play the games. Check it out on TpT. Click HERE. It's on sale for the next 2 days. It's that time of the year. Teachers are heading back to their classrooms to organize, rearrange, and gather their lessons together as they prepare for the first day of school. And with all of those preparations, comes thoughts of new students and teaching those essential procedures. I am a big "anchor chart" teacher. 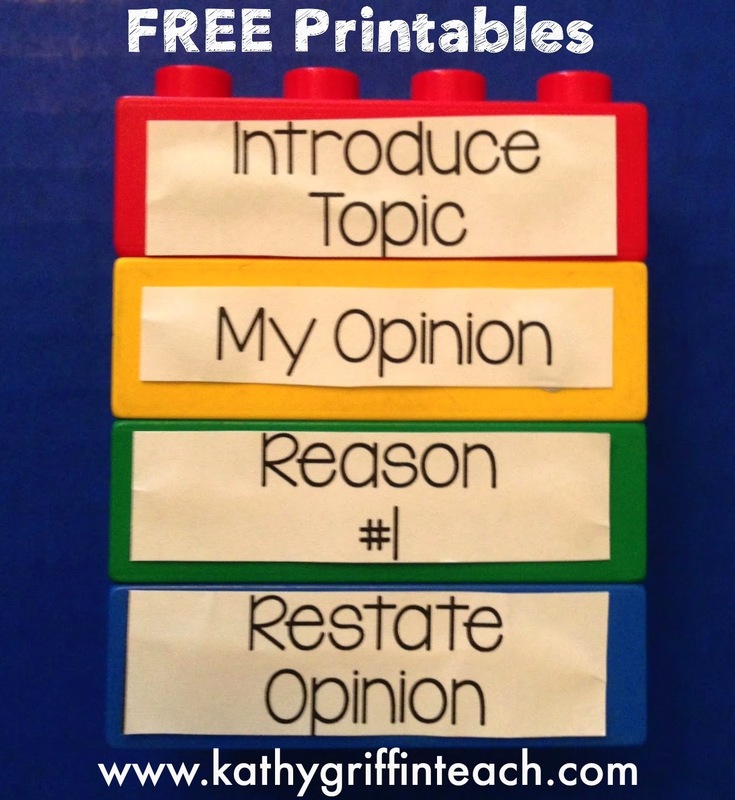 I believe every problem can be solved by building an anchor chart with your students. 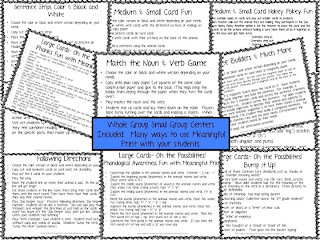 Here is my favorite one to do with my class. You can adapt it to meet the needs of your students' ages and developmental levels. If you have younger students, add some pictures. If you have older students, add more details. This chart is a springboard for a future chart we will build together. This is the . . . "What if" . . . chart. Just picture it in your head. You are sitting at the guided reading group table and children are coming up to the table to ask you questions. 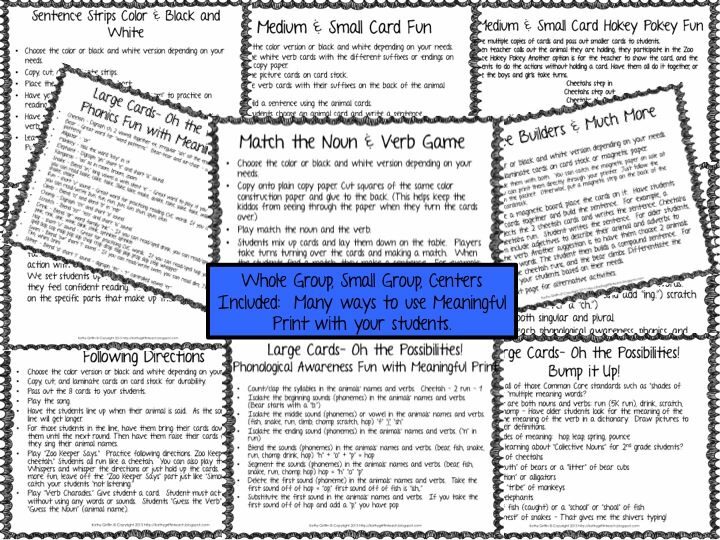 You are working with small groups in guided math. Once again, the students have burning questions. 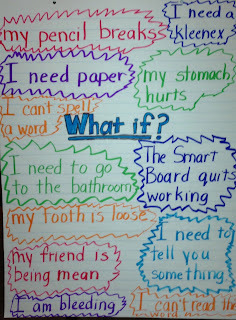 I take those burning questions and turn them into a "What If Anchor Chart." Here is how it works. Brainstorm a list of reasons that the students might need to interrupt you. Here is the beauty of this chart. It is a building chart that can be added to all year long. This chart gives students solutions to their problems. Yes, I know we all have procedures into place for a broken pencil, missing game piece, and broken technology. But there is something magical about the "What if" chart. I hang it close by my guided reading table and kindly point to it as children approach me. They learn really quickly all of the procedures for the "What if I need to interrupt you questions." I hope you drop by again for my next blog post. UPDATE in response to questions from readers 7-1-14. This is the "first" anchor chart to get them brainstorming their "burning" questions. I address them one at a time over the next few days - week. Sometimes a new one comes up and we address it immediately. We add it to our long anchor chart. I hang the Question-Answer Chart by my guided reading table. If a student walks towards me at the first of the year during guided reading or other small groups, I just point to the anchor chart. They usually nod their heads and read the chart. I use picture clues for younger students to help provide an anchor for them. The answers to the questions will be your routines. Here are some of mine. Question: What if I need to tell you something? Answer: Write in down and put it in the question box. Question: What if I don't know how to spell a word? 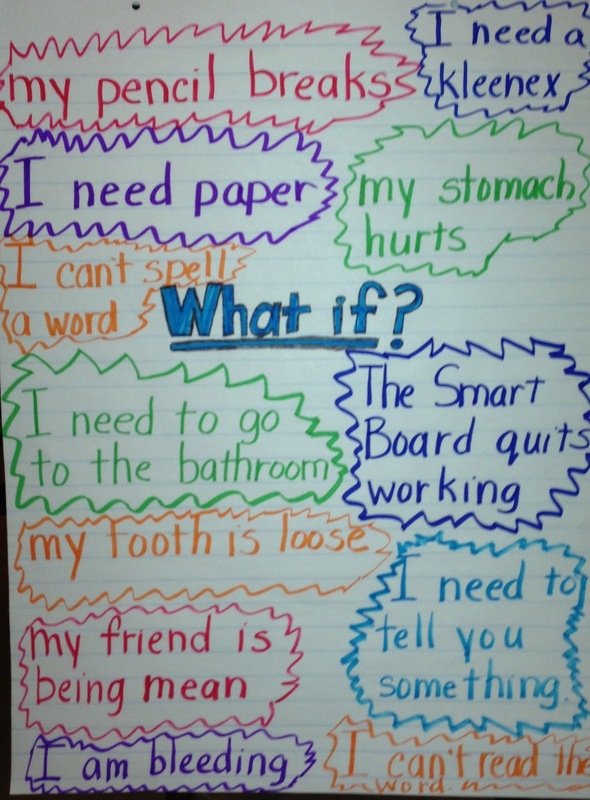 Answer: Look at the "I Need Help Spelling a Word" anchor chart. Question: What if my pencil breaks? Answer: Put it in the "no" box and get one from the "yes" box. Question: What if the Smart Board quits working? Answer: Go to another center. Question: What if I need to go to the bathroom? Answer: Use the bathroom pass and go. Question: What if my friend is being mean? Answer: Use your kind words and ask them to please use their kind words. Question: What if I need a Kleenex? Answer: Go get one. Use it. Throw it in the trashcan. We practice these scenarios as a class and model how to handle these issues. It doesn't take long to cover as you are establishing your procedures at the first of school anyway. It is like a worry chart in some ways. It really helps them realize where to look for help and become independent. I also tell them readers know where to look for information. Thanks for the feedback and for asking your questions. I just returned from presenting at I Teach K, DI, PreK-1st Common Core Academy, and the Extraordinary Educators Conferences. So what do I need to do now? Upload all of my new multimedia files, song, and games to TpT. That is a daunting task for anyone out there that is a seller. Preview files, pictures, zip files, OH MY!!! So this evening I am celebrating the first multimedia file loaded. Only 7 more to go! 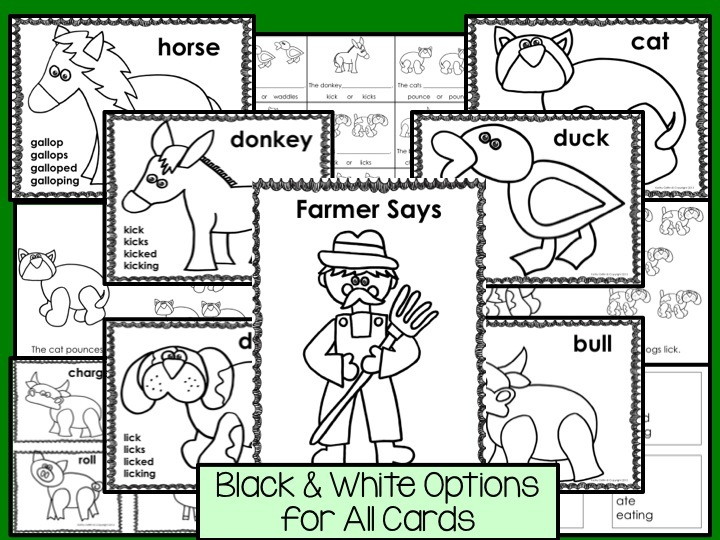 If you want a fun multimedia file to play on your Smart Board, Interactive Whiteboard, digital projector, or computer, then this is for you. 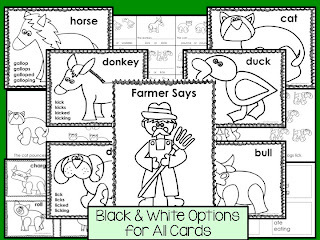 And the activity pack has sequencing cards, retelling cards, fun games such as "Farmer Says" and more. 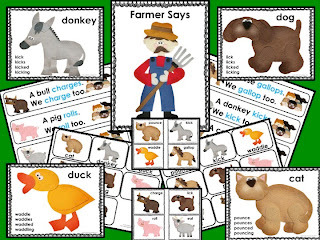 Teaching nouns and verbs can be fun for our little ones if we keep the music, movement, and creativity in the mix. 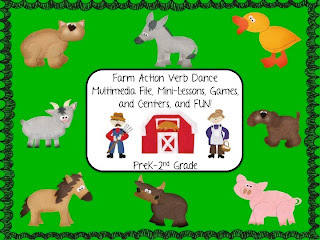 This packet contains the multimedia file, activity pack, and mp3 song with many activities for practicing nouns and verbs. Here is a brief clip of the Farm Action Verb Dance. And it will be on sale through Tuesday, July 31st. 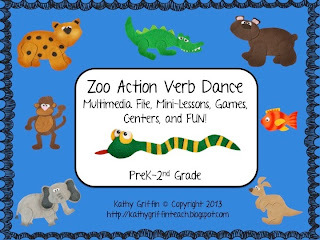 Stay tuned: The Zoo Action Verb Dance is coming soon along with Superheroes to the Writing Rescue multimedia mini-lessons for spelling, capital letters, punctuation, ideas, personal narrative, and opinion writing. And if tonight was any indication of how long it will take me to load them, there might just be a sale for each item I add. I'm back! 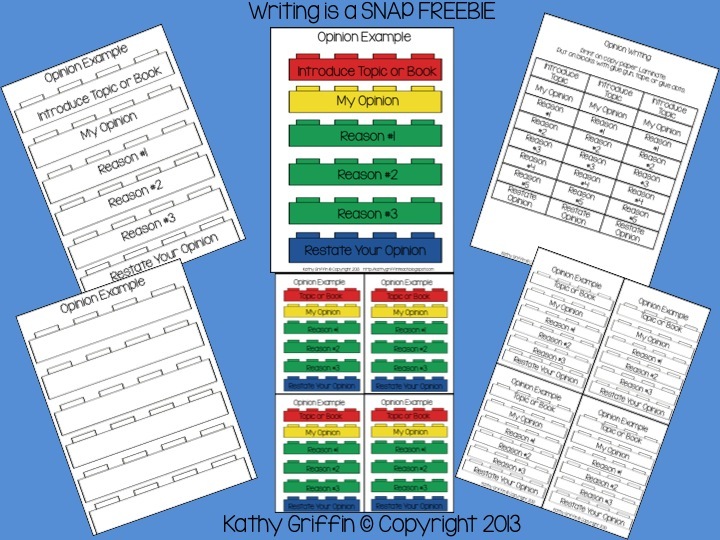 And to make up for being "missing" from the blogging action I have a FREEBIE just for you! I'm always thinking of ways to teach the Common Core Standards in an early childhood, developmentally appropriate way. As I was working with some students on Opinion Writing this past year, I noticed they were having trouble connecting the steps in the writing process. With the Common Core, our students have guidelines included for narrative, opinion, informational, and research writing. 1st grade students (and up) need to use linking words or temporal words to connect their thoughts. This can be hard for our young students to do abstractly. So here is where "Writing is a SNAP" was born. You can use any type of snapping block or cube to make this connection. Mega Bloks and Legos work great for this hands on analogy. There are several different types out there, and most teachers already have them in their classrooms. 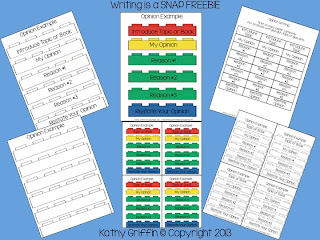 You could also use regular snap cubes manipulatives from your math center. 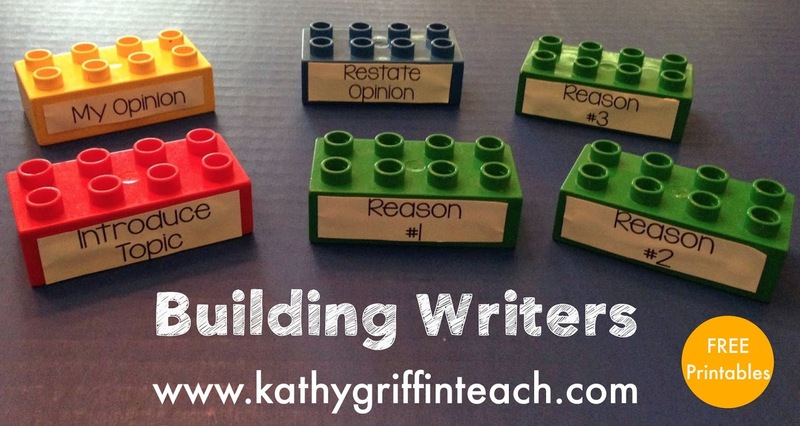 I use the analogy of building a building to connect to children's writing. Some buildings are one story and some are several stories. Here is the idea behind opinion writing. There are steps to writing an opinion piece. Each step (block) is connected to the next step (block). 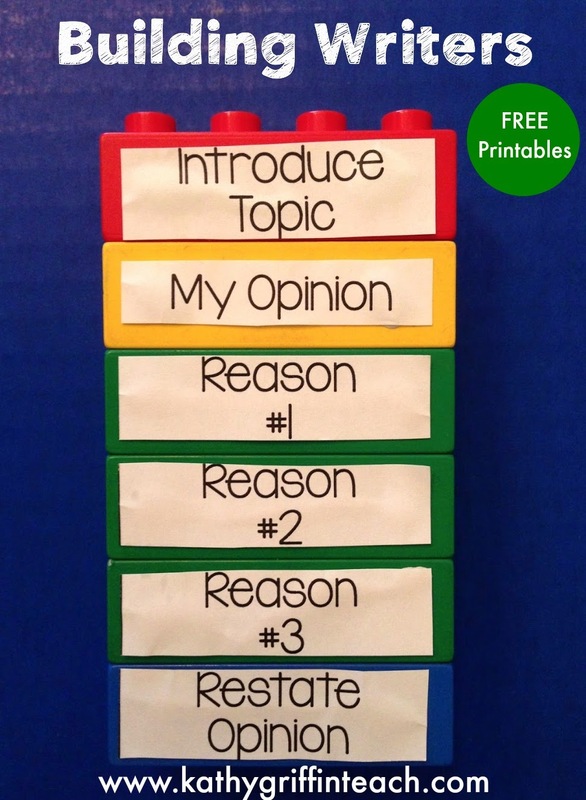 The linking words (top part of the Lego's or Mega Bloks) help connect one thought to the next thought (stories of the building). Without these connections, our building would fall over. These connections make our building stronger. 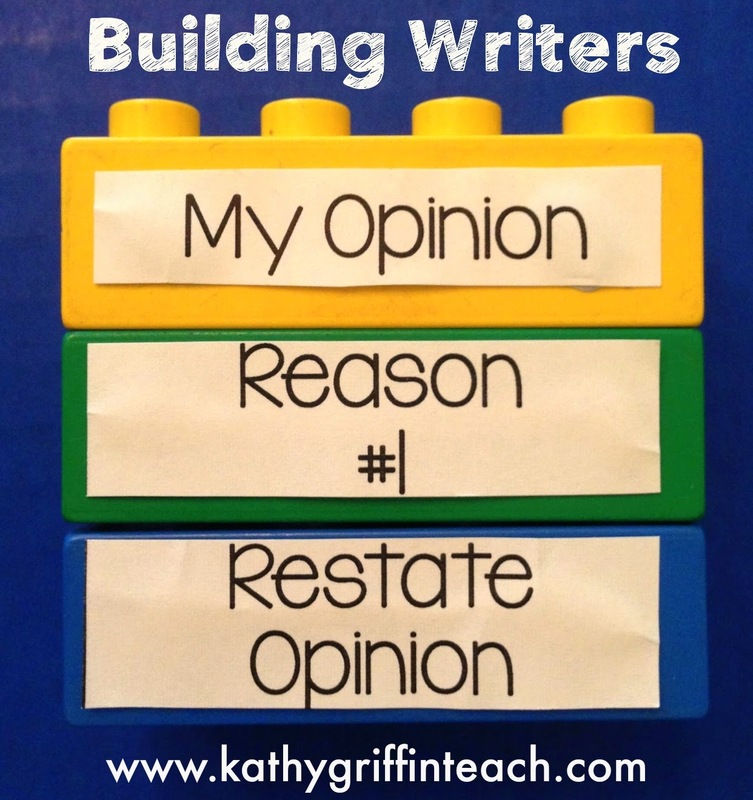 Here are the building blocks for Common Core ELA Opinion Writing. It is easy to model, manipulate and differentiate for your students. They can increase their stamina for writing by adding more thoughts, details, and reasons to their story. 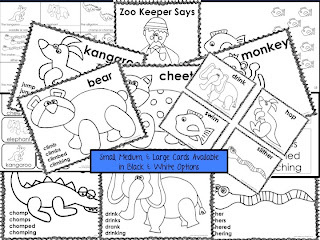 The following is a FREEBIE that I added to my Teachers Pay Teachers store. Here is a sample of the packet. Click HERE to download the FREE file. 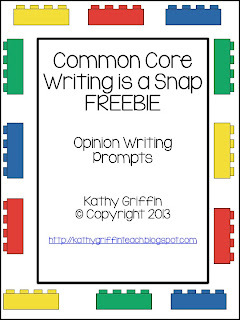 If you like this FREEBIE, check out the complete packet of COMMON CORE WRITING IS A SNAP. The packet contains building blocks for PERSONAL NARRATIVE, OPINION (contained in FREEBIE), INFORMATIONAL OR HOW TO, and RESEARCH WRITING. There are more multiple forms for each type of writing including LARGE BLOCKS for ANCHOR CHARTS.